The holiday season would not be complete without the annual Christmas-themed mystery from the great Anne Perry. A CHRISTMAS MESSAGE is the 14th installment in this series, and Perry likes to shake things up by involving various characters from her recurring series in each of these tales. This time out, the year is 1900, and the central character is Victor Narraway. Readers of Perry's Charlotte and Thomas Pitt series will recognize Victor as Thomas’ mentor and former supervisor in the Special Branch Division. One thing you are sure to get from an Anne Perry holiday story is less sentiment and more of an examination of the social and moral themes of the times. Either way, you are guaranteed to enjoy an expertly plotted story that will leave you thinking. "A CHRISTMAS MESSAGE deftly blends religious history, nail-biting suspense, international intrigue and Christmas spirit all in one small package. 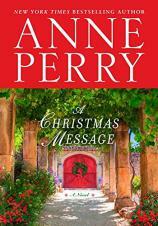 Once again, the annual Christmas gift Anne Perry gives her readers is a welcome holiday tradition." Dedicated “to all who follow a star,” Perry sets the stage for a Christmas odyssey that will be more spiritually historical than her prior efforts, but will still contain the prerequisite murder case. Vespasia Narraway is relishing the most cherished Christmas gift she had ever been given. Her husband, Victor, booked them on a trip to Jerusalem. Even though the year is 1900, the religious mood is just as it is today. Jerusalem represents an annual pilgrimage for Christians seeking to spend the season in Bethlehem, in the same way that Jews visit the area for the Wailing Wall and Muslims for the Dome of the Rock. While staying overnight in a hotel in Jaffa prior to their train ride to Jerusalem, the Narraways meet an interesting older gentleman with whom they share dinner. They are so swept up in this stranger, a fellow traveler at the start of his own personal journey, that they never even find out his name the entire time they speak. That is, until this same gentleman is found lying on his hotel room bed with his throat cut and the room ransacked. The Narraways learn that his name was Balthazar, which reveals itself in the piece of parchment he left in their possession. Their new acquaintance must have realized that the shadowy figure he kept looking at over dinner meant him harm and forced him to pass on his mission to the Narraways. Victor and Vespasia decide to follow through on the notation that indicated the Watcher draws near and the note must be taken to the House of Bread on the Via Dolorosa on Christmas Eve. They are aware of the significance surrounding the name Balthazar --- the member of the Magi who gifted the Baby Jesus with myrrh, which symbolized sacrifice. While on the train bound for Jerusalem, the Narraways come upon a fellow traveler named Benedict, who appears to have another piece of the puzzle that goes along with the piece of parchment they now carry. The Watcher is also on the train. This dangerous figure already killed once and now has Benedict in his sights. To get this message into the intended hands will take a feat of bravery the elderly Narraways may not be capable of. It will require a Christmas miracle to be successful. A CHRISTMAS MESSAGE deftly blends religious history, nail-biting suspense, international intrigue and Christmas spirit all in one small package. Once again, the annual Christmas gift Anne Perry gives her readers is a welcome holiday tradition.